I might as well face it I’m addicted to camisole tops. I use the free pattern download from Love Sewing here with instructions inside issue 43. They’re super quick to sew up and they’re amazing scrap busters. I’ve made four in total so far and have plans for several more. I can squeeze one out of half a metre if I use shop bought bias tape. I started with a toile made from a Primark bow cotton print sundress I’d long since been able to fit in. Mega cute! I made a straight M but added an inch to the length. I used flat self-fabric straps and used red bias tape inside. Then I made my silk parrot version and added flat crossing straps at the back. It was a little short in the body as I forgot to add the extra length but looks lovely with a skirt. This fabric is so precious to me, I got it on a fun shopping trip with Katie I have enough left for another top of some description but I can’t bring myself to make a mistake so haven’t chosen a style yet. Next up were two viscose versions in quick succession – both with the length added back in! This swallow print version is a lovely viscose I got from Simply Fabrics Brixton at the Knitting and Stitching Show at Harrogate. I added rouleaux straps for this version and it’s such a lovely delicate touch. This may be my favourite of the versions. Last but not least I used a remnant from Guthrie and Ghani that I picked up at Sew Brum. It’s a subtle print and there was just enough for a camisole so I treated myself! Sadly I used vintage bias binding inside and it hasn’t held up to the wash. The bias has ripped in multiple places so I’m going to have to unpick and re-stitch which is disappointing. Unpicking black on black is the worst!! The pattern comes together pretty easily and you may actually spot this was an old Sew Loft pattern. It’s not as nice as the True Bias Ogden Cami which has a lovely facing but if I thought about it properly I’m sure I could draft a facing and change up the construction to make this my dream button loop front cami top. More sewing plans, not enough time! Now I wouldn’t say I live particularly close to Birmingham. But it really is a great place for a meet up. And that’s what is happening on October 4th. Charlotte of English Girl At Home is our host for a big fun filled day of shopping and chatting. Plus there’s a chance to win prizes ooooh! 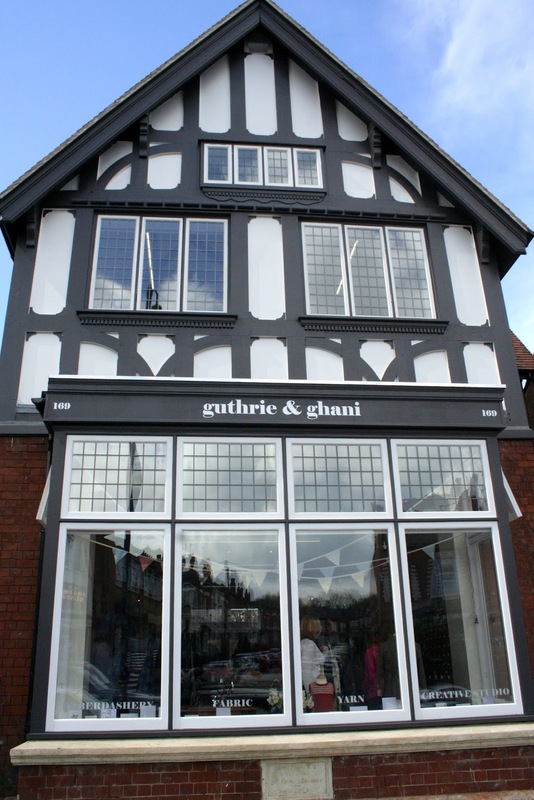 The exciting bit is that, as well as taking in the fabric shops in Birmingham city centre, we will be popping to Moseley Village (by bus), home of Guthrie and Ghani. I think their fabric selection is stunning so I’m rather excited about that part of proceedings. More details will be released nearer the date of the event but the provisional plans are as follows. 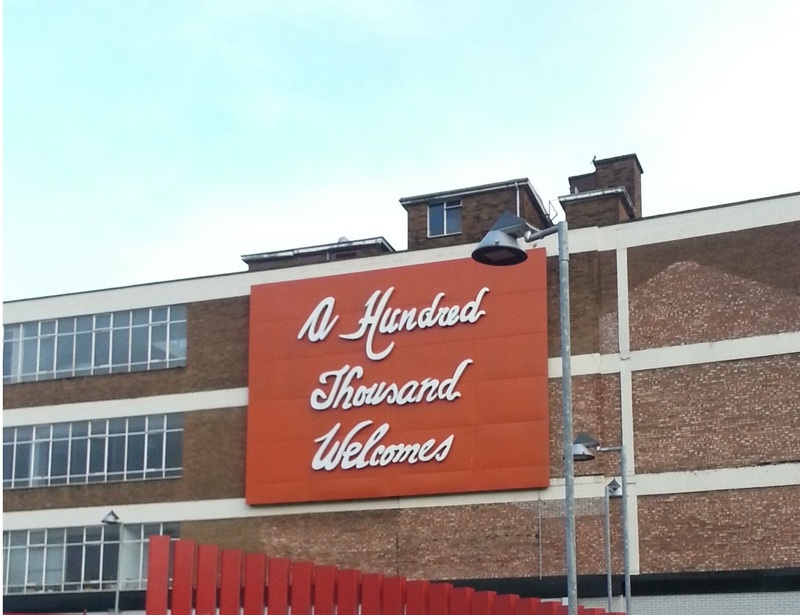 10:30 – 12:30: Birmingham’s fabric stores! (Barry’s Fabric; Fancy Silk Store; Bull Ring Markets). The Bull Ring markets and fabric stores are located close together so attendees can decide where they would prefer to spend their morning. I love Barry’s so I’ll definitely be going there! And the market has always been good to me. 12:30 – 13:30: Reconvene and travel to Moseley Village (Guthrie & Ghani) by bus. (The journey between the city centre and Moseley only takes 15 by bus. Buses are every 5-10 minutes). 13:30 – 16:00: Guthrie & Ghani. Attendees will have plenty of time to spend in the shop which sells sewing and knitting supplies (patterns, fabric, wool & notions). The studio above the shop will be available to attendees from 14:30 onwards where we will be able to natter, compare purchases, and hold a pattern & fabric swap. Tea/coffee and cake will be available in the studio with all donations for refreshments going to Parkinson’s UK. There will also be a fabulous raffle of sewing-related goodies, again with all money raised being donated to Parkinson’s UK which I think we can all agree is a lovely idea. I’ve had a peek at the prizes and oh boy they’re good! You might have noticed: A group lunch isn’t currently planned, but Charlotte is happy to provide some recommendations of good places to eat in Birmingham and Moseley. Sign up here to let Charlotte know you’re going to attend. And I’ll see you there!